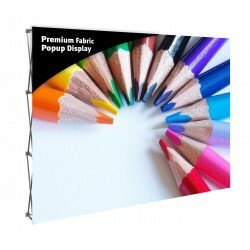 Pop up style fabric trade show displays have a collapsing scissor truss frame that folds down very small for storage, but expands easily to form the structure to hold the fabric graphics. Even though it's very light weight, it looks solid once the graphics are installed. 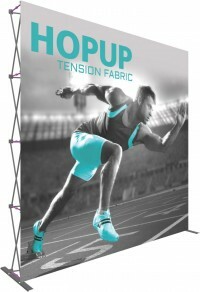 The Hopup tension fabric trade show displays are the easiest to set up, which makes them very popular. Since the fabric graphics stay attached to the display, expanding the frame is all that's necessary to set up the display in most cases. 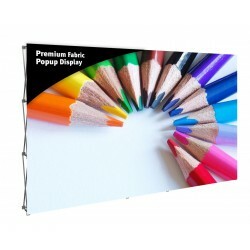 Displays with fabric end caps require the end caps to be pulled loose from the velcro on the frame to collapse it, and must be reattached once the frame is expanded. 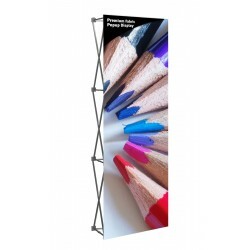 Embrace fabric displays are a cross between the Hopup and a silicone edge graphic display. They have a similar expanding frame to the Hopup, but the Embrace has SEG channel bars that attach to the frame to hold the graphics. The graphics don't stay attached like they do with the Hopup, but with the Embrace there is no visible stitching where the velcro is attached, which makes for a cleaner look. 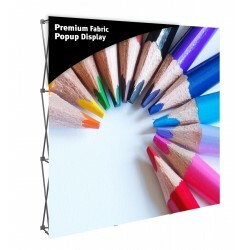 The pop up fabric displays in this category come in a range of shapes and sizes. If you need help in choosing a pop up fabric trade show display or for advice on what will work best for your needs, please contact us.